What is blocking, and do I really need to block garments that I knit? Blocking makes everything you knit look nicer. Since I knit mostly in the round, I don’t have separate pieces to block, I block the whole garment when I have it completed. I wet block, which is really the same as washing the garment by hand. I soak it in warm water and a mild soap, rinse well, then spin it in my washer on spin only to get most of the water out. I then smooth it out on a towel to dry. You can also block small things and stubborn areas (such as bottom bands that flip up) by steam blocking. This is done by laying the piece flat, holding a steam iron about 1/2 inch above your work and puffing steam into it. Make sure the iron does not touch the fabric. Then pat the area into shape and let it cool. You can block any fiber, but wool takes blocking the best. 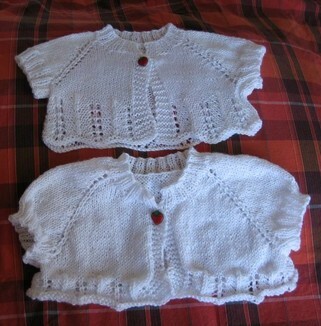 Here is a photo of 2 little shrugs, (one small and one medium) knitted in acrylic, the top one is blocked and the other is not.